I am delighted to embark on a new series of Humane Results. Having written 250 weekly columns, I thought to make it a fortnightly column. This is to create more breathing space amidst a welter of administrative tasks and a hectic teaching schedule. What I have in mind is to relate them more into the aspects of human behavior with due relevance to Sri Lankan organisations. It is also a fresh start for me as a full professor in management. 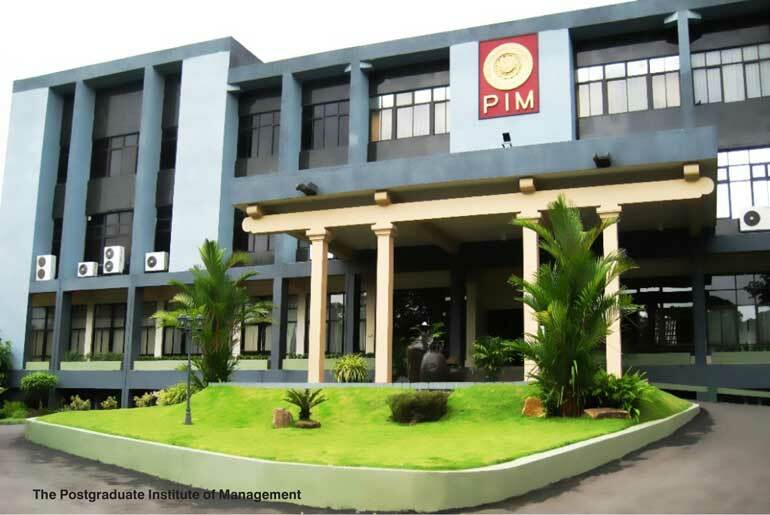 This will strengthen my role as the Director of the Postgraduate Institute of Management (PIM). I have realised that it is a complex and challenging role that demands competence and commitment. 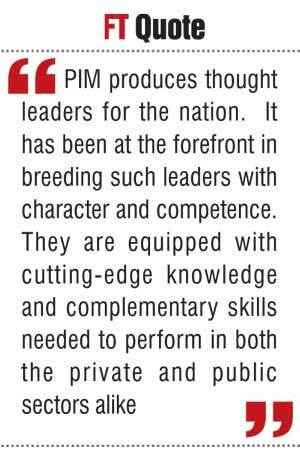 The leadership of PIM has passed from one generation to another. I thought it an opportune time to reflect on PIM in particular and the role of management education in general. My association with PIM goes back almost 20 years, considering my involvement as a student, visiting faculty member, consultant, lecturer, researcher, trainer and leader. I collectively introduced a five-year strategic plan towards making PIM a centre of management excellence in South Asia, with five pillars in focus - teaching, research, partnerships, infrastructure and governance. Under a new theme entitled ‘Igniting Human Imagination’, PIM saw several new initiatives such as a student research day, an innovation forum and multiple MBA specialisations. Let’s discover more of this premier enterprise. Excellence is all about being exceptionally good. When applied to enterprises, it involves exceptional achievements in a consistent manner. That’s why the Postgraduate Institute of Management (PIM) is proud of being a self-financed and semi-autonomous public entity. PIM produces thought leaders for the nation. It has been at the forefront in breeding such leaders with character and competence. They are equipped with cutting-edge knowledge and complementary skills needed to perform in both the private and public sectors alike. Being the pioneer of advanced management education in Sri Lanka, PIM provides leadership to those who are in the business of innovating and disseminating management know-how as well as to those who are in search of higher learning alternatives. The history of the institute goes back to 1981, when a division of the Postgraduate Studies was set up at the Faulty of Management Studies of the University of Sri Jayewardenepura. The division started postgraduate studies in management with a collaboration with two Canadian Universities – Ottawa University and Carleton University. In 1986, the division was upgraded to a separate institute under the University of Sri Jayewardenepura. The new institute was formally set up at a rented building at Sri Saranankara Road, Dehiwala in April 1986 and it continued to operate from there up to 1994 when the institute was moved to the new building constructed at Lesley Ranagala Mawatha, Colombo 8. The institute has produced so far around 100 CEOs, 1,000 directors and almost 10,000 managers. It holds convocations of its own, in time intervals of approximately 18 months. Prof. Gunapala Nanayakkara, Dr. Kanthi Kamalgoda, Dr. Basil Perera, Prof. Uditha Liyanage and Prof. Mangala Fonseka were the former directors who steered PIM from strength to strength. PIM’s approach has always been strategic. Strategy formulation and implementation is the sure way forward in achieving sustained results. PIM’s forward path is shaped by its current five-year strategic plan (2015-2019). 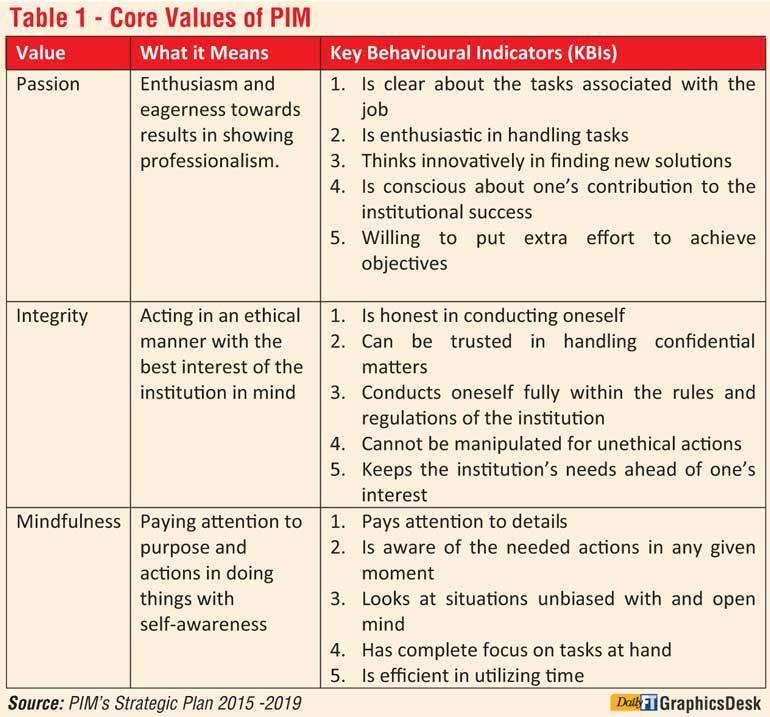 It begins with the PIM’s Vision, Mission and values followed by goals and objectives and Key Performance Indicators for the said period. We ignite human imagination by developing leaders with global presence and local pulse. In doing so, we pursue innovative teaching, cutting-edge research, enriching partnerships, greener infrastructure and good governance. PIM has formulated three core values, namely passion, integrity and mindfulness. The key behavioural indicators of those values are as shown in table 1. Teaching Excellence: This has been the forte of PIM. Among the recent improvements, only a third of a three-hour session is typically devoted to the straight lecture component i.e. to tell. The remainder of the session is devoted to show (e.g. showing a video), to ask (e.g. engage students in discussion/debate), and to do (e.g. do an exercise or case study). The faculty is aware of the need to use all four modes of delivery to make a great impact on the student managers and to achieve the desired learning outcomes. Research Excellence: PIM is the leading higher education institution in the country that conducts research in the discipline of management. We have a dedicated research centre. While many MBA programs elsewhere have conveniently abandoned the most precious learning activity of research, we proudly continue to improve upon the quality of our research activity in the MBA program. Research interests developed at the Master’s level are promoted through the doctoral program of study. Partnership Excellence: PIM recently signed an MOU with the University of New South Wales, Canberra, for research collaboration. This is the first time in Sri Lanka where such a comprehensive collaboration will take place with research fellowships and faculty exchange. PIM also has an MOU with Mobitel Lanka, a leading mobile telecommunication provider for Research and Development activities related to blended-learning using the ‘M-Learning’ platform. Among other key partnerships are bonds with leading public and private institutions to train their executives and the association with the PIM alumni for their continuous development. Infrastructure Excellence: The second stage of the PIM building complex costing more than Rs. 200 million is to be implemented. An audio-visual centre, more lecture halls, larger ICT centre, meditation hall and many other modern features will be among the new additions. Upon completion of the building, the institute will be in a position to provide extended and expanded services to the students as well as to the corporate community. Governance Excellence: The autonomy of the PIM is enshrined in the enabling legislation which provides for administrative, financial and operational freedom. Moreover, the PIM does not rely on any budgetary allocations from the General Treasury, not even for its capital expenditure which includes the construction of new buildings. We strive to maintain transparency and accountability with clean audit reports. Master’s courses at PIM, particularly the MBA, have earned a name for producing thought leaders to the nation. In brief, leaders who can think and act without just acting. We harp on the need to ‘be an MBA’ than to ‘have an MBA’. In fact, we moved one step ahead in inviting our ‘learning partners’ to ‘be brilliant as an MBA’. This is of high relevance in the context of current environment. With the ever changing demands in the business world today, enterprises need more professionals to drive businesses ahead. A professional is a person who approaches a problematic situation with a particular structured approach by using a body of knowledge to apply specific skills for the situation. An MBA essentially caters for developing such professionalism. Hence the ultimate goal of an MBA is to develop professionals who can produce results in a more systematic, consistent and sustainable manner. PIM has revitalised its research focus with the establishment of its dedicated research centre. It has coordinated a vibrant doctoral program through links with leading foreign and local researchers. We believe in creating “world-class researchers” with right quality and quantity. Managerial issues with national, regional and global significance will be our focus to gain a better understanding. Research collaboration with overseas institutes has already begun. We see a bright future for aspiring management academics through our research endeavours. The Sri Lankan Journal of Management (SLJM), a publication of PIM and the only sustained management journal throughout the years, is moving towards a reputed journal ranking. Being a Professor of Management whilst leading PIM provides a plethora of opportunities for serving the deserving communities. Adhering to best practices with the appropriate use of technology is the way forward in ensuring enhanced quality and relevance in all our initiatives. PIM will continue to produce value in practicing values as a premier management education institute. 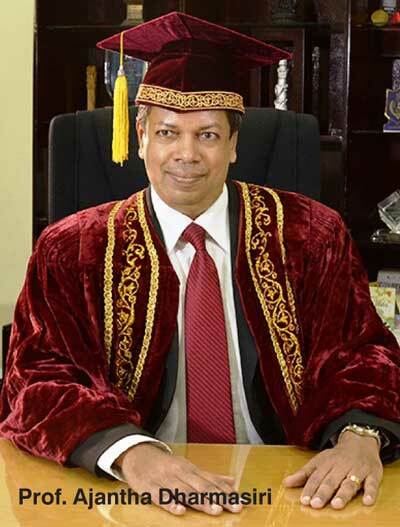 (Prof. Ajantha Dharmasiri, Professor in Management, is the Director and the Chairman of the Board of Management of the Postgraduate Institute of Management. He also serves as an adjunct professor in the Division of Management and Entrepreneurship, Price College of Business, University of Oklahoma, USA).